Tour de France riders have started the most treacherous stage of the first week - facing seven bumpy sections of cobblestones as the race heads home to France. France's Sylvain Chavanel is wearing the yellow jersey for Tuesday's 132-mile rolling ride from Wanze to Arenberg Porte du Hainaut. He was among the lucky riders who avoided crashes a day earlier. Seven-time Tour champion Lance Armstrong and defending champ Alberto Contador of Spain were among dozens of riders who hit the asphalt. Armstrong is fifth overall, and Contador is seventh. American Christian Vande Velde was one of two riders who crashed out. The Garmin-Transitions team leader broke two ribs in a spill during Monday's ride from Brussels to Spa. Most fell toward the end of the 125-mile ride from Brussels to Spa, in the Stockeu pass downhill, after a motorbike crashed and spilled oil minutes before the cyclists arrived. Sunday's first stage was also marred by multiple crashes. But all that drama could be nothing compared to what the bunch faces in Tuesday's 132-mile ride from Wanze, Belgium, to Arenberg Porte du Hainaut in France. The stage features seven cobblestone sectors on very tiny roads, including four in the last 18½ miles. More crashes are expected. In total, there will be eight miles of cobbles. 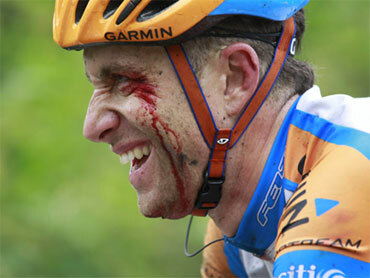 "Going.To.Be.Carnage," Armstrong said on his Twitter feed last week after scouting out the stage. "Someone will lose the race that day, I just don't know who it's going to be. It could be Lance, could be Alberto, could be (Andy) Schleck," Garmin-Transitions team manager Jonathan Vaughters said. Armstrong, who is fifth in the overall standings and ahead of Contador by five seconds, has the upper hand on his rival on the cobblestones. Armstrong is a more experienced rider, and Contador first rode on cobbles this season. "Lance is better on the cobblestones," RadioShack manager Johan Bruyneel said. "But to drop somebody (Tuesday) will be difficult." To avoid crashes, all teams will want to ride at the front of the peloton before entering the cobbles sections. "That was important to see them," Bruyneel said, referring to the scouting of the stage. "And it actually was worse than we thought. It's gonna be a really nerve-racking finale." Earlier this season, the 38-year-old Armstrong demonstrated that he could handle the cobblestones with a strong showing at the one-day classic Tour of Flanders, which he used as a training run before the Tour. Bruyneel said Tuesday's cobblestones sections are by far more difficult than in 2004, the last time Tour de France riders had to tackle cobbles. That year, Armstrong's rival, Iban Mayo of Spain, crashed ahead of a cobbled section and his hopes to knock Armstrong off his perch were dashed in a single blow. Contador, who like Armstrong sustained only bruises and scrapes in Monday's crashes, is particularly wary of the cobbles. "For me, it's the worst day," he said. Among the riders who crashed Monday, Christian Vande Velde pulled out from the race after breaking two ribs. His Garmin-Transitions teammate, and fellow American, Tyler Farrar broke his left wrist but is expected to be at the start on Tuesday. "There was no way to stay on the bike," said Armstrong, who also sustained an abrasion on his hip. "There was something on the road ... I was scared. I think everybody was scared." Equally unlucky was 2009 Tour runner-up Schleck. The Luxembourg rider appeared to injure his elbows in another spill. He returned to the race and rejoined the pack. Sylvain Chavanel of France earned his second career Tour stage victory Monday and took the race leader's yellow jersey off Swiss rider Fabian Cancellara who, like Armstrong and Contador, trailed 3:56 in the main pack. Armstrong placed 54th and Contador was 81st. After all the crashes, the peloton refused to sprint as a protest, upsetting last year's green jersey winner Thor Hushovd. "I feel frustrated by what happened," Hushovd said. "Our team was working hard and we would have had a good chance for victory. I feel like they have taken something away from us. Everyone made a gentleman's agreement not to sprint, but I lost an important opportunity to try to win the stage and gain points." After Schleck dropped several minutes back of the pack - threatening his Tour title ambitions - the main bunch appeared to slow down, with his Saxo Bank teammate Cancellara at the front. Between Schleck and Chavanel's group at the front, confusion broke out in the pack about how to respond. "There was a group up the road, we didn't know what to do," Armstrong said. "The Schlecks were behind, some other guys were behind. It was sort of a conflict about what to do then." While some riders criticized Tour organizers for the dangerousness of the stage, Armstrong said crashes and bad weather are part of the sport. "These hills around here and the Ardennes are legendary, it's part of cycling," Armstrong said. "Liege-Bastogne-Liege (one-day classic race) has been around for a hundred years and they do that on the snow. That's bad luck. For whatever reason the road was slippery and it's by no means any fault of the organizers."